There is something to be said for tradition. The consistent and time-honoured experiences and rites that over the years eventually become the stuff of legend. 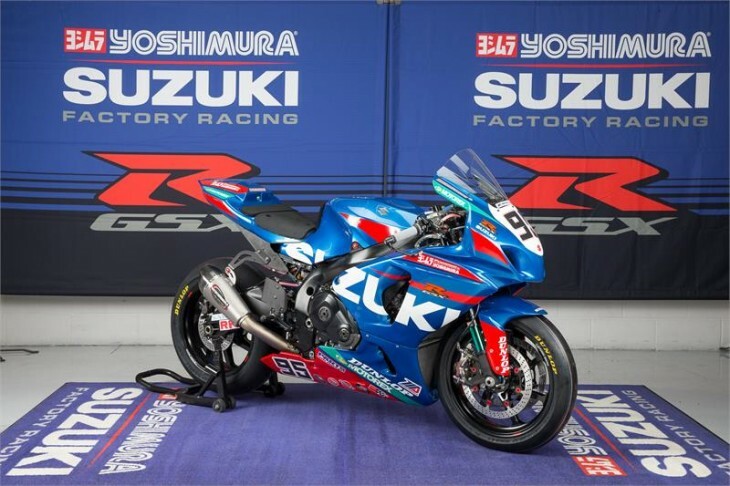 And when it comes to road racing, Yoshimura Suzuki Factory Racing is truly steeped in tradition – the tradition of racing and, perhaps more importantly, the tradition of winning. Indeed, the team is legendary. For decades, Suzuki has been the dominating force in MotoAmerica AMA Superbike. No other manufacturer even comes close to approaching the extraordinary number of records that Suzuki has set within this genre of racing. From the number of championships captured, to the overall races won, to the pole positions set, Suzuki stands alone. And for the 2016 season, Yoshimura Suzuki is poised to add even further to its winning traditions. Former AMA Pro SuperSport Champion Roger Hayden, who finished third in MotoAmerica AMA Superbike last year, is again joined by former AMA Road Racing Rookie of the Year Jake Lewis. The team will also host well-known Grand Prix racer Toni Elias riding as a ‘sub’ for the team. The trio of talented riders will race the championship-winning Yoshimura Suzuki GSX-R1000. Thanks to Suzuki’s proven Championship DNA and superior technology, the upcoming year of racing Yoshimura Suzuki is looking for nothing less than another championship and the 2016 AMA Superbike season will once again see Suzuki Own The Racetrack. Roger Hayden is the veteran member of the championship-winning Yoshimura Suzuki Factory Racing team for 2016. Prior to joining the factory team in 2014 he raced the GSX-R1000 for a Suzuki satellite team. Hayden picked-up his first-ever AMA Superbike victory in 2012 before finishing third overall in the series. He followed-up that performance by finishing on the podium six times and taking fourth overall in the 2013 standings. Then in 2014, Hayden had his best season to date, scoring eight podiums, including a victory at New Jersey Motorsports Park, to finish runner-up in the series standings. Last season, he was a model of consistency, finishing on the podium 15 times in 18 rounds to finish third in the championship. Now, starting his third year with Yoshimura Suzuki, Hayden is eager to earn more podiums and wins as he contests the MotoAmerica AMA Superbike Championship with Suzuki’s full factory support. Jake Lewis returns with Yoshimura Suzuki in 2016 to contest his sophomore season in America’s premier road racing championship. Yoshimura Suzuki has a long history of taking young up-and-coming racing talent and molding them into champions. Both Kevin Schwantz and Ben Spies got their first shots at a full-time AMA Superbike ride with Yoshimura Suzuki and now teenager Lewis is hoping to follow the same path as those past legends. A former AMA Horizon Award winner and AMA Pro Racing Rookie of the Year, Lewis was the leading MotoAmerica Superbike rookie in 2015, finishing fourth in the championship and earning an impressive five podium finishes. Former MotoGP winner and Moto2 World Champion Toni Elias will substitute for the injured Jake Lewis in the early portion of the 2016 MotoAmerica schedule. While Elias has primarily been a Grand Prix rider for most of his career, the 32-year-old Spaniard is no stranger to Superbike racing. He raced for an Aprilia satellite team in the Superbike World Championship in 2013 and 2014. This will be Elias’ first opportunity to race on the legendary Suzuki GSX-R1000 Superbike.